In response to market demand for a cost-effective locomotive for rail yard switching, Atlanta-based company, Railserve, jumped at the opportunity to supply a solution. The majority of locomotives in service today are used for long-haul trips and are not suited to in-plant rail switching—a process that uses locomotives to safely move railcars within industrial, manufacturing and production facilities. Also, the price tag of purchasing a long-haul locomotive is a stretch for most of Railserve’s customers, who are primarily moving railcars within their own facilities. As a company that puts their customers first, Railserve took on the challenge of designing a less-expensive, lower-horsepower, ultra-low emissions genset locomotive for in-plant rail switching. The first Railserve LEAF® (Lower Emissions And Fuel) Gen-Set Locomotives were built at Railserve’s facilities in Longview, Texas and placed into service in 2008. At the time, the company used the LEAF locomotives in its own fleet providing third party switching services to major manufacturing companies in the U.S. and Canada. Demand for the locomotives grew among switching customers and expanded to other facilities where the customers were using their own employees to operate the LEAF. In 2013, Railserve came to the Export-Import Bank of the United States (EXIM Bank) to finance an export sale to a buyer in sub-Saharan Africa. This would be a whole new ball game for the business, and Railserve needed to be sure it had the financial security to confidently and successfully engage. In return, EXIM Bank agreed to finance the sale of Railserve’s LEAF locomotives to Societe d’Exploitation du Transgabonais (SETRAG), a railway operator in Gabon, Africa. The Bank guaranteed a $10 million loan extended by American Trade & Finance Company (Atrafin) to facilitate the export. This created up to 20 jobs at Railserve’s manufacturing facility in Longview. EXIM’s loan guarantee mitigates the potential risks associated with selling to foreign buyers and ensures that the U.S. business gets paid. The product provides competitive financing options and flexible repayment terms for international buyers that otherwise may not have been available from lenders. EXIM Bank—which has a congressional mandate to support the export of U.S.–made goods and services to sub-Saharan Africa—authorized more than $2 billion in financing to support such exports in 2014, the largest total in the Bank’s 84-year history. "With this transaction, we’ve not only leveled the playing field for an American manufacturer in a highly competitive global market, but we’ve also empowered Railserve to hire more American workers in Longview,” said EXIM Chairman and President Fred P. Hochberg. "This deal is a great example of how the Bank’s financing equips American exporters to beat the competition overseas while supporting jobs at home." Railserve was able to outbid its Chinese competition thanks to the financing it applied for and received from the Bank. 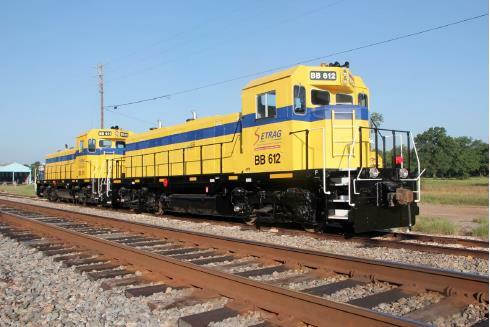 As a result, the company’s locomotives are now being used in Gabon as part of SETRAG’s plans to improve railway operations. EXIM has supported $38.2 million of Railserve's exports during the period from 2014 to 2018.